The Stingers controlled the pace for much of the game but couldn’t capitalize early. Photo Daren zomerman. “[We had] a couple of breakdowns. We didn’t play as thoroughly in the third period as we did in the first two. I think that game was ours,” said Stinger Chase Harwell. The score may not have shown it but the rookie forward’s assessment of the first two periods of play is certainly true. The Stingers men’s hockey team looked smothering on defence and dangerous on offence against a strong goaltender through 40 minutes of play that ended 0-0. The problem for Concordia was the next 20 minutes. 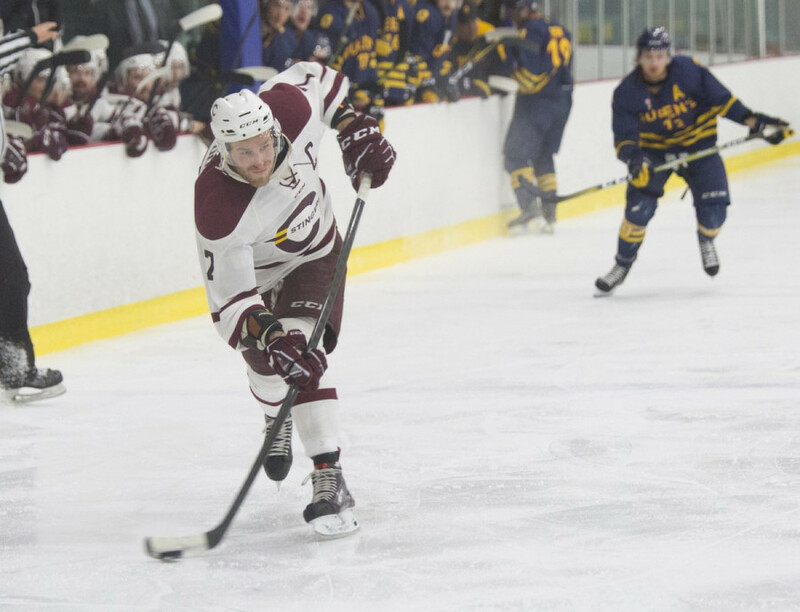 The Université de Québec à Trois-Rivières Patriotes scored three goals in the third, two of which came less than a minute after the Stingers’ lone goal of the night by Alexandre Gosselin. “I think we allowed them to have a bit too much momentum. That probably cost the game,” said Stingers captain Philippe Hudon. Hudon and his teammates looked in control to start the game. They doubled their opponents’ shot count through the first period and led by more than 10 in the second. The defence controlled most of the chances that came their way and Marc-Antoine Turcotte looked as solid as ever in net. Blocked shots, cut passes, strong puck movement and scoring chances: The Stingers looked prepped for a strong third period. 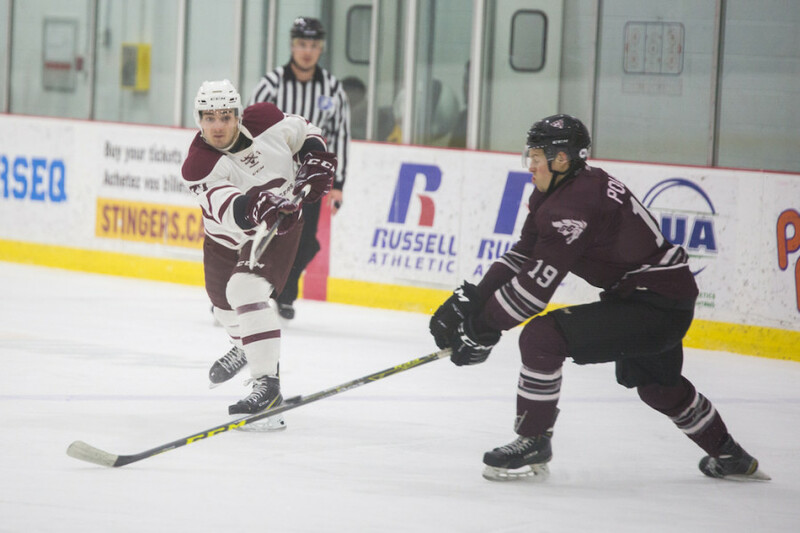 Less than a minute after the Stingers tied the game at one, UQTR scored the game winning goal. Photo Daren zomerman. “I thought we were playing pretty well [the] first two periods. [The] second period we dominated them more than they did us,” said Stingers defenceman Matthieu Desautels, adding some praise for the play of new rookie blueliners Bradley Lalonde and Charlie Roy. In a game that’s well into the third period and hasn’t seen any goals, the first isn’t usually a pretty goal; it’s almost always a “just get the puck in” kind of goal. So it was for UQTR who got a tap-in goal in the crease and began to take control of a game that had been in the Stingers hands. Concordia would tie the game on the powerplay not much later, but the Patriotes quickly answered back not once but twice, deflating the Stingers. The team that had been so hungry and quick on pucks through two periods. They looked tired and were losing battles they had won just 20 minutes before. Head coach Marc-André Élément believed the turnaround stemmed from players simply trying to do too much and trying to “get fancy” to create offence rather than sticking with a simple game plan. The Stingers got away from themselves, their game plan and their identity in the third period. In a sport where things can change in a split second, the phrase “you’ve got to play a full game” is repeated by every fan, player, and coach at one point or another. It was a team-wide refrain for the Stingers post-game. “It’s a matter of staying focused for 60 minutes. We were really solid for 40 minutes,” said Harwell who had to leave the game for a part of the second period to get his lip stitched. The team’s early offensive struggles can be partially attributed to the fact that several rookies, including NCAA division one transfers Colin Grannary and Dylan McCrory among others, have not been able to play so far this season. The Stingers dressed defencemen Curtis Gass and Philippe Charbonneau as wingers for the game. While both performed well and neither were to blame for the loss in any way, having a full lineup of forwards soon should help the Stingers’ offensive depth moving forward this season. The Stingers’ next game is Oct. 19 at 7:30 p.m against the York Lions.